Margaret Stuart, the proud wife of a prosperous Iowa farmer, sets high standards for herself and others. Happy in her marriage, she tries to look the other way when her genial husband, Alec, takes to the bottle. When Elspeth, Margaret's sister, comes to live with them, the young woman is immediately captivated by the beauty and vitality of the farm and by the affection she receives from those around her. But as summer turns into fall and the friendship between Alec and Elspeth deepens, Margaret finds her spirit tested by a series of events that seem as cruel and inevitable as the endless prairie winters. 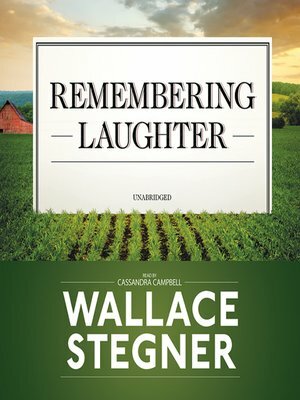 Remembering Laughter marked Wallace Stegner's brilliant literary debut. Wallace Stegner (1909–1993) wrote many books of fiction and nonfiction, including Crossing to Safety and the National Book Award–winning The Spectator Bird. Angle of Repose won the Pulitzer Prize in 1972.